Voluntary donations help secure the development and maintenance of the Games and Resources page. Donations are processed through Paypal using either a credit card or Paypal account. Your contribution is very much appreciated. Thank you! 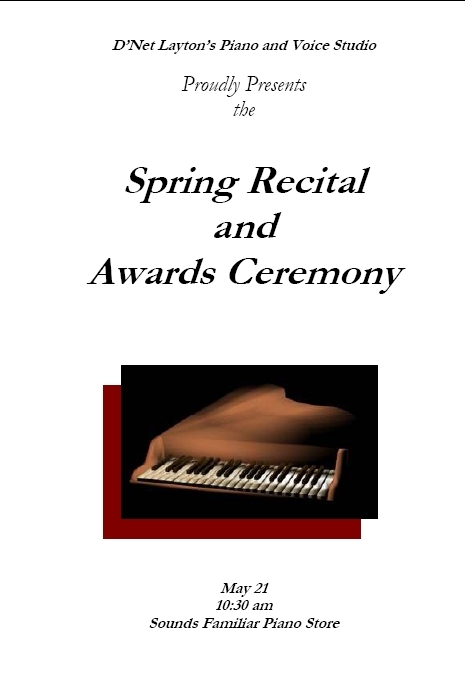 Since this is a busy time of year for so many music teachers, I thought it might be helpful to post a few of the recital programs I have used in the past. They are done in Microsoft Word, and all you need to do is type your information in over the sample text. Feel free to change and customize this all you want to fit your needs. 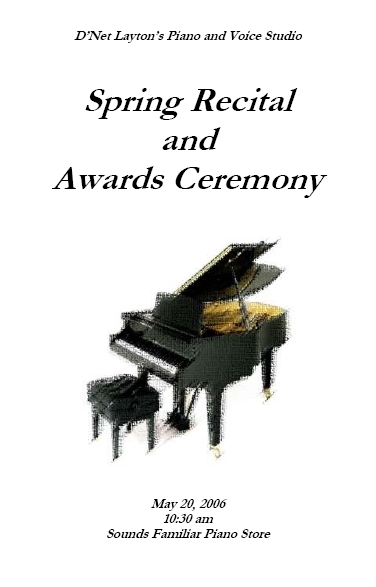 If you really want to go all out, you can do like I do and put a photo and short blurb about each student in the program. If you have Microsoft Publisher, I can mail you the template I use for that program. Just drop me an e-mail! I was so excited this morning! I have a beginning student that was going to be introduced to quarter notes today. I got everything ready, and waited, and waited…but he didn’t show. 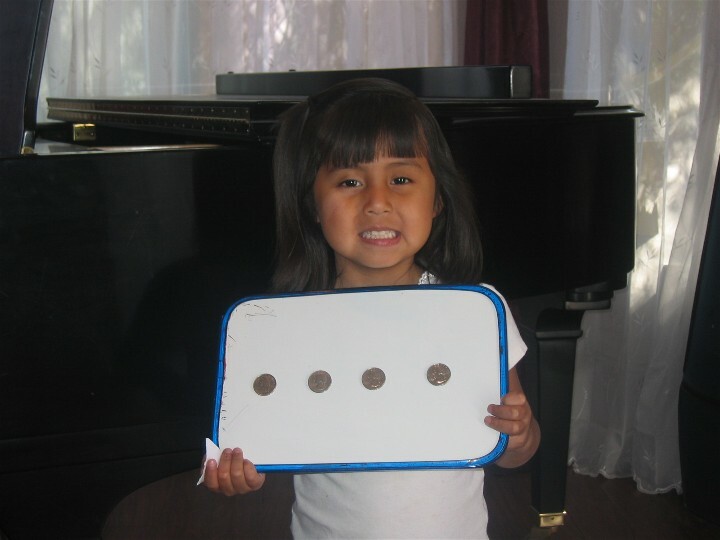 I didn’t want to waste the preparation, so I enlisted my daughter to show everyone our incredibly fun and memorable “Introduction to Quarter Notes” lesson. To begin with, I put a bit of tape on the back of 4 or more quarters and stick them to a white board. I explain to the students that every time we see a quarter, we will clap and say “ta.” I will often let the students use boomwhackers or other rhythm instruments for this activity. Then, I magically change the quarters into quarter notes by adding stems. I make a big deal of turning the quarters into quarter notes. We then clap and ta the quarters again. I ask the student many times throughout the rest of the activity what kind of notes we are playing. Next, I have the student take a quarter away. I erase the stem, and replace it with a quarter rest. We then clap the rhythm again, saying “sh” on the rests. We continue taking quarters away until we are left with only quarter rests. I ask them at every turn what kind of notes they are clapping. It’s not too hard for them to remember it is a quarter note or quarter rest! Next, I tell the students that if music publishers actually put quarters into all of the books, not only would they be very heavy and cumbersome, but also SUPER expensive! To fix this, they just use black dots instead of actual quarters. I then draw quarter notes on the board, and we clap them just the same as before. Finally, they have a test. 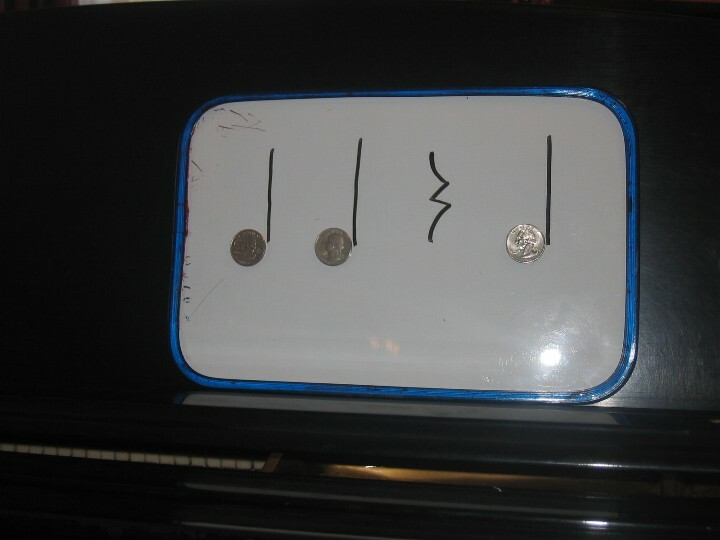 They have to tell me which symbols are quarter notes, and which are quarter rests. They clap several rhythms all by themselves. If they are successful (which they all are after all of that) I dub them the Quarter Note King or Queen. 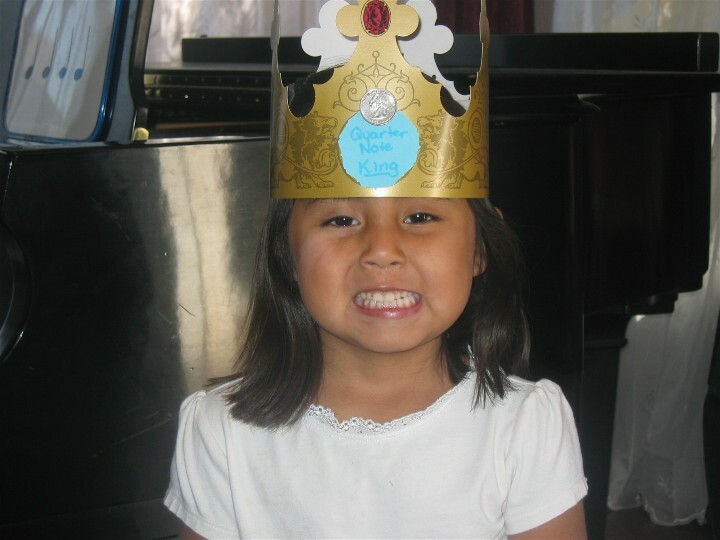 I crown them with a Burger King hat, with a quarter or two taped to it. The students are so excited to show their parents the honor they have earned, and they NEVER forget the name of a quarter note! My good friend Claire showed me a wonderful technique chart she had made for her studio. I liked the idea so much I made a poster for my own studio. I LOVE it! When a student masters a scale, they earn a foil star in the corresponding box. Different colors of stars represent various levels. For example, red stars for pentascales, blue stars for 1 octave scales, and so on. Since only the major keys are listed at the top of the chart, we use small dot stickers inside the stars to show the minor key has been learned. I can tell at a glance where an individual student is and what technique they are working on. 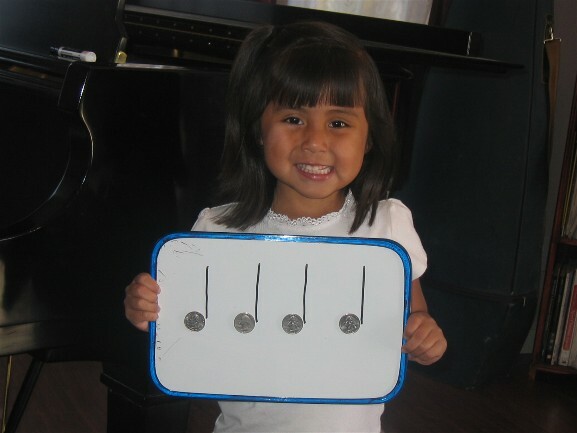 Students are actually excited to do their scales, because they earn a point for each star, and seeing the progress of other students keeps them motivated. My chart also has spaces for local MTA events that the students have participated in. I thought it would be nice to modify the chart for general use. The major and minor keys are listed across the top, and the left column is blank for student names. Version 1 has a key similar to what I use in my studio, telling what colors of stars represent each skill level. The second chart has no key, so you can use it however you would like. 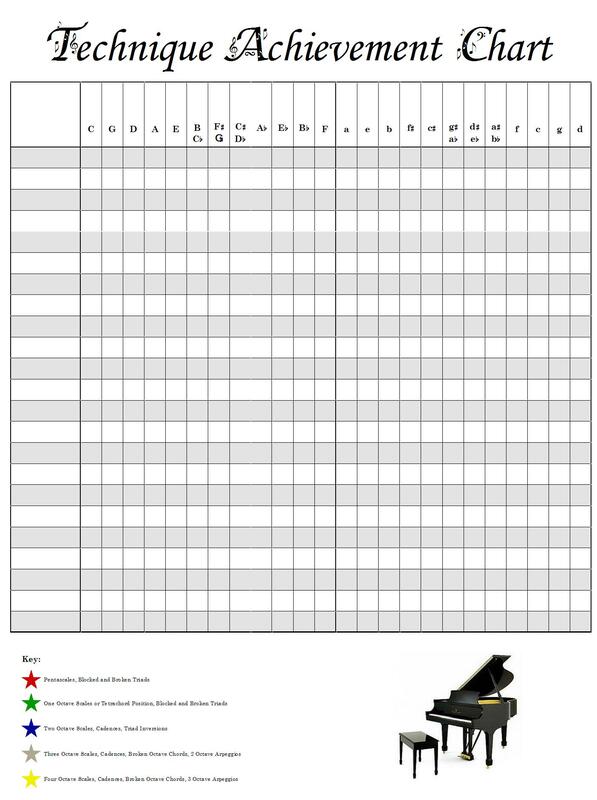 The chart will print on 4 sheets of paper, and will be about 15×19 when finished. Trim the paper at the crop marks, mount on a half sheet of poster board, and you’re ready to go. Note: when the picture is clicked, lines are missing on the chart. 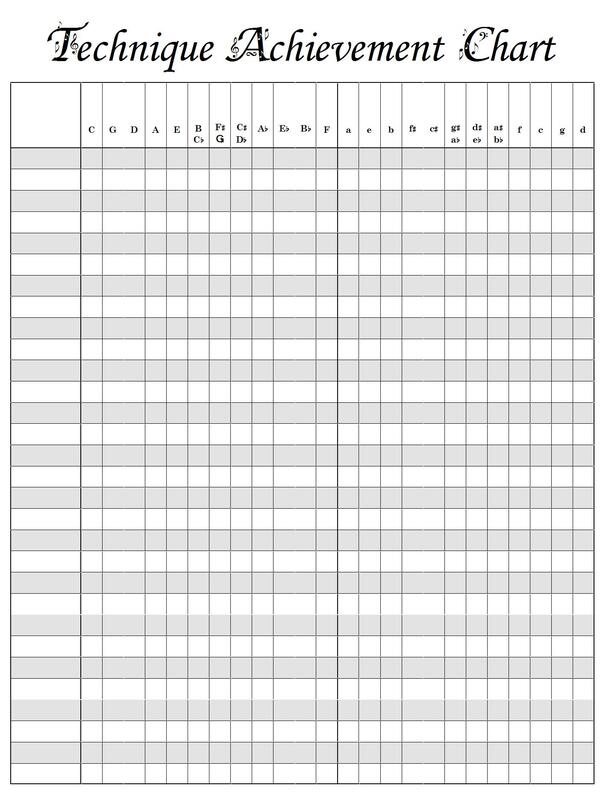 Click on the words, and your chart will look and print as it should.